Cranfield have been manufacturing colour in the UK since the 1970's and the company has been run by three successive generations of colourmen. Using traditional processes, the Cranfield group created top quality dry pigment inks and the machines and principles are the same now as they were they started. 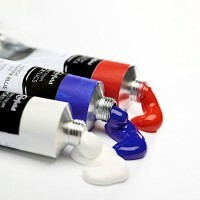 In 2009 Spectrum Artists' Paints joined the Cranfield family. With a reputation for quality hand made paints made from traditional raw materials, Cranfield felt that Spectrum would be a perfect fit for them and allow them to cater to both fine art print makers and artists alike.